A well-known feature of Windows 10 and its predecessors (XP, Vista, 7, 8, 8.1) is the wake timer, which when triggered, is responsible for waking your Windows PC up from either Sleep/Hibernate in order to perform scheduled tasks for system security and stability (e.g. System Maintenance, Windows Updates, Windows Defender Scanning). While this feature might be useful for the average Windows user, it might not be so great for the bit more tech-savvy users who might actually want Windows to remain in Sleep or Hibernate without automatically waking to perform tasks. Part 1: Disable the most common Wake Timer setters. Part 2: Deal with the other uncommon Wake Timers. *Explanation: This will list all currently set wake timers. *Explanation: System Maintenance is enabled by default in Windows 10, for system security and stability. *Explanation: Whenever Windows Updates are manually or automatically installed, a Windows Update Restart Wake Timer is created. Solution if you prefer Automatic Windows Updates (the default setting): Reboot your system, and the Wake Timer will disappear. Solution if you prefer manually installing Windows Updates, and not to have Automatic Windows Updates that create pending restart wake timers that wake your system: Disable Automatic Windows Updates. From now on, once you manually install updates, immediately reboot your system to extinguish those Wake Timers. 2.5 If the message says ‘There are no active wake timers in the system’, all currently set Wake Timers have been disabled! With the above steps, all current Wake Timers will be disabled and your system will remain in Sleep or Hibernate without automatically waking up, at least for now. However, from time to time you might still get wake surprises. This is mostly due to system updates (e.g. Windows Updates, driver updates, new hardware, applications) that create wake timers. Now let’s move on to identifying out the responsible Wake Sources. 1 Begin by tracking down that Wake Source. This is done by checking the Event Logs of your system that give valuable information. 2 If the Wake Source is a Device, move on to Step 3. If the Wake Source is A Message, jump to Step 4. If the Wake Source is Unknown, jump to Step 5. 3 Assess whether to disable wake for, or uninstall, the faulting device driver. NOTE: Most device drivers should not wake the system, but occasionally device manufacturers may introduce bugs that wake the system. If the device requires vendor-proprietary drivers, continue at Step 3.1. If the device doesn’t require a vendor-specific driver (as in the case of a mouse/keyboard), continue at Step 3.2. If you don’t know whether your device requires vendor-specific drivers, simply continue at Step 3.1. 3.1.4 Congratulations, Wake events are now disabled for the problematic device. Remember to file for a bug report to your device manufacturer to correct the issue. NOTE: This step ensures Windows won’t reinstall those problematic drivers automatically. 3.2.4 Reconnect the device to reinstall basic drivers from Microsoft. 3.2.5 Congratulations, with the default driver, no Wake events should occur for this device. 4 Disable any power-related service. 4.3 Congratulations, you have successfully stopped Service-related Wakes. 5 Find out which Task woke your system, and disable wake for that scheduled task. 5.1 Copy all of the following code. 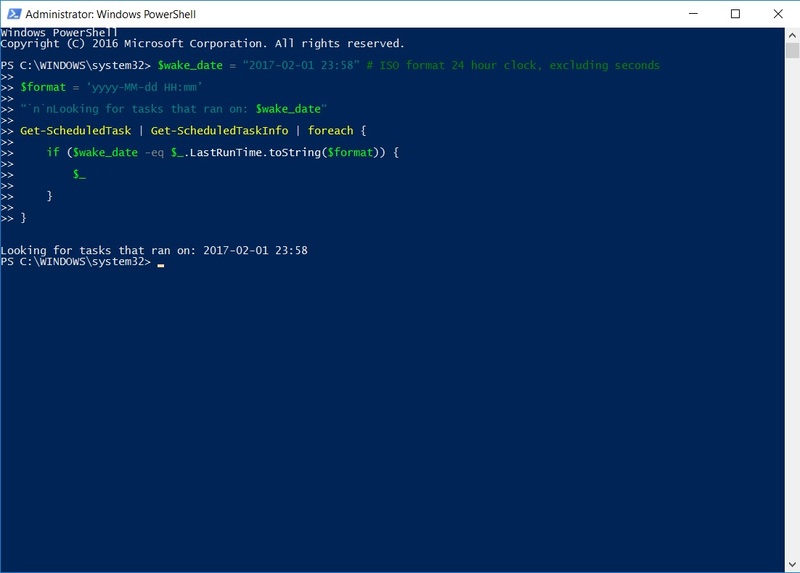 Now we’re ready to use Windows Powershell to uncover those pesky tasks. NOTE: This will show you a list of Tasks that occurred within the same minute as the wake event. You should most often see only a few Tasks. In my case, the Scheduled Task’s TaskName is “Reboot” and is located in folder “\Microsoft\Windows\UpdateOrchestrator\”. We’re almost done, we just have to disable the wake for this Task. 5.8 Repeat Step 5.6 for each Task you find in Step 5.4. 5.9 Congratulations, you have successfully disabled wake for problematic Scheduled Task(s). However, if you are still getting Wake issues, move on to Step 6. 6.0 Find out the responsible Application, by closing / restarting them. 6.1 Unfortunately there’s no easy way for this one. Because Event Logs don’t give us any information as to which application woke the system, we have to resort to the process of Elimination. 6.2 Try closing the Most Suspicious Applications. There are two from my experience: Spotify and VirtualBox. 6.2.1a From my experience (Happened on 23rd November 2017, on version 1.0.68.407.g6864aaaf), Spotify seems to set a wake timer when it has an update, but you haven’t restarted it to update it. 6.2.1b Solution? Close it, reopen it to update it. Pressing the X button to close it might minimize it to the Tray Area on the Toolbar (depending on settings) , so make sure to close it fully. Then reopen it to update it. 6.2.2c That should stop Spotify from waking your PC every minute. 6.2.2a From my own usage of Virtualbox, a running Virtualbox VM instance might randomly set a wake timer. 6.2.2b Solution? Shutdown / Save state the running VirtualBox VM(s). 6.2.2c That should stop the VirtualBox VM from waking your PC every minute. Explanation / Discussion: I am still unsure about the cause for this one. My suspicion though is that it might be related to VirtualBox’s network adapter settings, because it often happens to one of my VMs that uses an Internal Network. Yet again, it also happens on regular bridge network VMs, much more rarely though. So there might just be a bug in the interface between the VirtualBox Hypervisor and the PC’s physical network card. Maybe someone has a better idea. 6.3 Sleep your PC as usual. 6.4 If it wakes up again, repeat Step 6.2 until you identify the suspicious application. After all, that was how I found out that one of them was Spotify. If you have followed the guide entirely, you would have learnt a great deal about the variety of Wake Sources; who would’ve known it would be so complex. The good news is that you will now be able to deal with any present wake problems and future gotcha wake surprises – all to keep your system is wake-proof. Hi, thanks for one of the most comprehensive instructions on how to handle this! I think I followed this in detail, but I end up at a junction that your instructions don’t cover: I have no reason known for the waking up (Event Viewer, powertroubleshooter reason for waking up: none), so I skip to “5”. But unfortunately, Powershell also returns nothing. Is there anywhere to go from there? 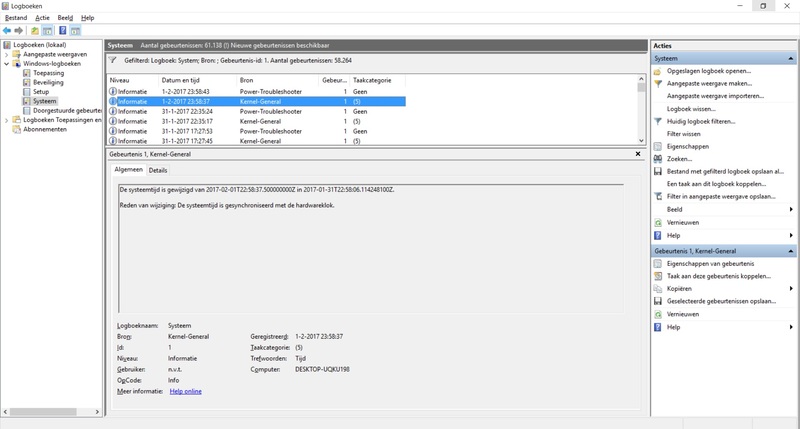 Seconds before the computer wakes up, there is a notation in the Event viewer that claims “system time was synchronised with hardware clock”. Same minute, but also not mentioned by the Powershell-routine. (I do have issues with the clock being days or hours out of sync, tried everything that sounded plausible on the net bar me measuring the bios back-up battery in my <1 year old laptop, but I never fixed this). i5 Medion laptop on WIN10. Teamviewer 11.0.65452 Mentioning this as version 10 was supposedly identified as the culprit for waking computers sometimes. Wake-on-LAN is off and not connected via cable anyway. Waketimer query results in 'none'. Hi R-P, appreciate the detail in your reply; I suspected my article to cover most but not all grounds pertaining to wake issues on WIndows 10. Regarding the hardware clock message, ignore it, it’s a normal message. You mentioned your PC has a weak bios battery. But that doesn’t matter, since both the Event logs and the PowerShell script use the within-Windows time. Based on your 2nd screenshot, there’s no Scheduled Task problem. You also said TeamViewer 11.0.65452 has an issue with waking computers. Where did you get that info? Because if it’s from the TeamViewer forums, then it is likely to be the issue of specific applications (e.g. Spotify on Windows 10 used to create Wake Timers), in which case have to wait out for a patch. And for now the best way would be to close TeamViewer before sleeping your computer. You are right that Wake-on-Lan will not be triggered without an Ethernet cable connected to your PC. Just to be sure, disable wake for network card and all other suspicious devices (follow Step 3.1). Just to mention that sometimes a reboot can fix these wake issues. Recently on my other PC, I was seeing repeatedly random waking 1 minute after sleeping. I went through my entire process of tracking, finally concluded that it might be a bug with WIndows 10 (likely caused by Windows Updates without rebooting my system yet). I rebooted it and the problem went away. Yes thank you sOOOOOO much! I also disabled devices from waking up computer, I have went under scheduled tasks and tried to remove all I could….it still wakes up from hibernate. Sometimes within a couple minutes of going to sleep or several days but it will always wake up. no matter what I try. Need help. Why can’t hibernate and Sleep just perform their purpose until I wake it up? Is Microsoft so afraid that I’ll never wake my computer again that they feel the need to force it? I promise Microsoft, I’ll wake up my computer again and then feel free to update or whatever you fear is so immensely important. Hi mike, whenever your PC wakes up you can try checking the event log (Right click on Start button > Event Viewer. In Event Viewer, Expand the left pane Windows Logs > System, And look for under column ‘Source’ for Kernel-Power. Click through the few entries corresponding to the time of the PC waking. That might give you a hint to the source of the waking, you might try googling the exact log message etc. I have updated the article with Steps to diagnosing Surprise Wake Sources. I’m pretty confident that will help you track down and resolve the problem. My apologies for the slow update. Hi Fabio, I’ve never heard of such a system implemented across machines as a service, my guess from what u tell me is that the machine is part of a Windows domain and it is locked down to domain policies if your pc is a part of a commercial company. If that is the case, it won’t be possible to disable it, but since you told me the problem only began recently, it’s possible that the recent patch introduced a bug – a wake timer – so you’ll just have to wait out for the newer version that (hopefully) fixes it and report if it doesn’t. That was what happened on one of the versions of Spotify on Windows 10 when I first upgraded from Windows 8.1. I remember trying to file for a bug report when I noticed others had already opened one reporting the same issue. The wake timer bug was fixed in a week or two.